Serve drinks or decorate an ottoman with this vintage inspired rectangular tray. Featuring beveled edges, two cutout oval handles, and a rustic whitewash finish, there isn't anywhere this elegant tray can't be displayed. 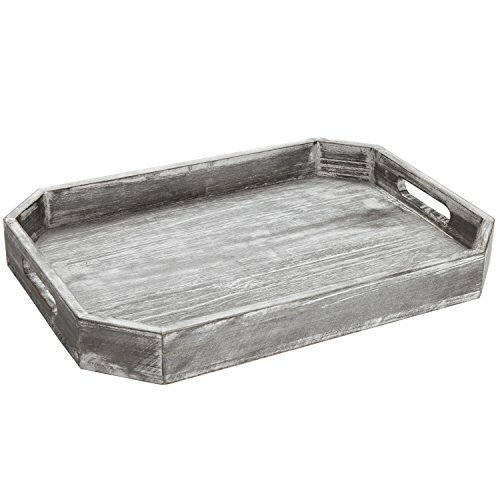 Raised edges make the tray ideal for carrying appetizers, cocktails or snacks to awaiting guests. A weathered look, add character to any vanity for organizing jewelry, cosmetics or hair supplies. Casual antique decor can be added to any bathroom for holding guest towels, potpourri and lotions. Magazine and media remotes can be corralled in the living room. With decorative appeal and multi-use abilities, this tray is the perfect addition to any home or office setting. SPECS: 2.0 H X 16.5 W X 11.8 D (in inches). SERVING TRAY: Rectangular tray, with beveled edges, create ideal serveware for appetizers, drinks, desserts and more. ANTIQUE DECOR: A wooden construct and rustic dark grey finish, give an antique look to this modern tray. CUTOUT HANDLES: Two oval cutout handles allow for easy transportation, while raised edges help the tray's contents stay put. MULTI-USE: Could be used for holding magazines on an ottoman, storing jewelry or cosmetics on a vanity and display lotions and hand towels in the bathroom.